Tata has launched the updated Tigor at prices now starting from Rs 5.20 lakh, going all the way up to Rs 7.38 lakh (ex-showroom Delhi). Along with added features including a 7-inch touchscreen infotainment and projector headlamps, the updated sedan features subtle aesthetic changes as well. It continues to rival the likes of the Maruti Dzire, Honda Amaze, Ford Aspire, Hyundai Xcent and Volkswagen Ameo. But do these updates make the Tigor a more compelling purchase over the segment leader Maruti Dzire? We find out which one is more value-for-money purely in terms of the features these cars offer at a given price point. Before diving into the details, let us compare the dimensions and mechanicals of the two sub-compact sedans. Verdict: The Tigor is better equipped than the Dzire and is more affordable too. However, the Dzire remains our pick here since it gets basic safety features like ABS with EBD and ISOFIX child seat anchors. These features are a must-have in our books and are absent on the Tigor. Infotainment: Music system with Bluetooth and steering-mounted controls. Other features: Height-adjustable driver seat, rear centre armrest, day/night IRVM, adjustable front headrests, front and rear power windows and electrically adjustable ORVMs with turn indicators. What Tigor offers over the Dzire: Cornering stability control, alloy wheels, projector headlamps, electrically foldable ORVMs with turn indicators, auto climate control, cooled glovebox, rear parking sensors with camera, front fog lamps, 7-inch touchscreen infotainment system with Android Auto and multiple driving modes. What Dzire offers over the Tigor: ISOFIX child seat anchors. Verdict: The Tigor XZ+ is certainly our pick between the two variants compared here. 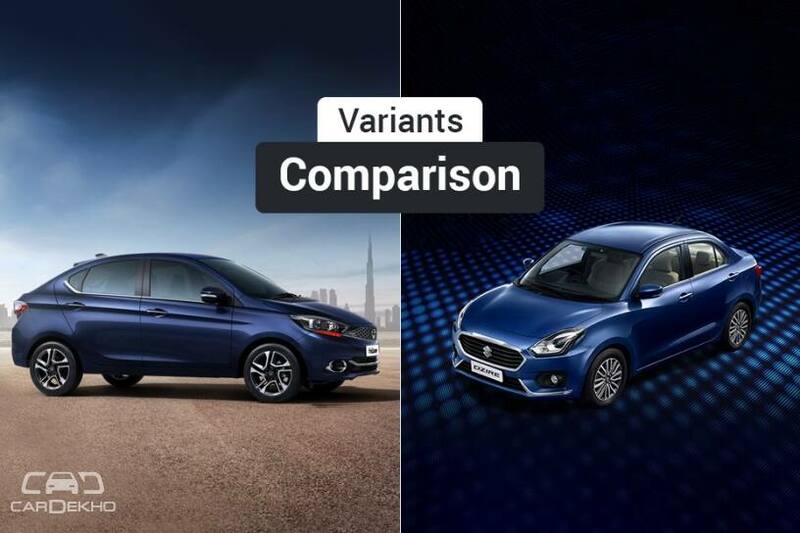 It is way better equipped than the Dzire, while being priced in the same range. However, if you have small children, we will recommend you to go for the Dzire, since it is equipped with ISOFIX child seat anchors. Other features: Height-adjustable driver seat, manual AC, rear centre armrest, day/night IRVM, adjustable front headrest, front and rear power windows and electrically adjustable ORVMs with turn indicators. What Tigor offers over the Dzire: Cornering stability control, alloy wheels, projector headlamps, turn indicators on ORVMs, cooled glovebox, rear parking sensors, front fog lamps and sport driving mode. Verdict: The Tigor is certainly our pick. It is way better equipped than the Dzire while being more affordable. However, if you have small kids in your family, we suggest you go for the Dzire, since it is equipped with ISOFIX child seat anchors. Buy Or Hold: Wait For MG Hector Or Go For Tata Harrier, Jeep Compass, Mahindra XUV500, Hyundai Tucson?